Thinking about the jackets we wear on our day to day activities, the materials that most often come to mind are either Polyester or Nylon, and for good reason. Being two of the main fabrics used in jackets, nylon and polyester can be found in the majority of jackets, including those which are designed for high-performance. Often part of specialized fabric technologies, nylon and polyester make up the laminating base for the membranes that are used in these technologies. Cotton or wool might also come to mind, as they can be found in many jackets. Cotton, in particular, is used in several types of jackets and coats, from those suitable for milder weather, to those that are made to withstand the cold. A material that does not really spring to mind right away is Elastane or also commonly referred to as Spandex, Lycra or Dorlastan. 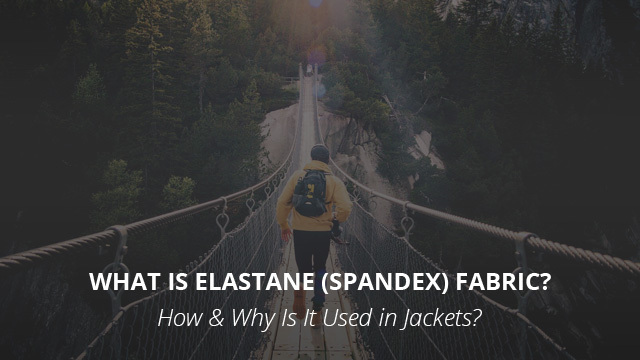 In a recent article, which touched on the qualities and use of Polyester, we mentioned it being used alongside Elastane in jackets, which is quite an important material for several types of jackets, as you will see during this article. Today we will learn a bit more about this material, its composition, how it came to be and, most importantly, how and why it is used in jackets. 2. How is Elastane Made? 3. Characteristics of Elastane Fibers: Why Are They Used? 4. Why is Elastane Used in Jackets? 5. How is Elastane Used in Jackets? Elastane was invented in 1937 in Germany, originally, as a substitute for rubber. Later, after DuPont, the company that created Nylon and Polyester, started producing the first nylon polymers, there was further work done to make nylon fibers less rigid and more stretchable. This is when it was discovered that polyurethane could be spun into fine threads and made to be more elastic. The first elastane fibers were produced by Farbenfabriken Bayer, however it was around the late 1950’s that actual elastane fibers for use in fabrics were developed, with DuPont and U.S scientists working independently. When you think of Elastane, the names Spandex and Lycra sound like brand names for this material, however Spandex is a simple anagram of the word “expands”, whereas Lycra is indeed a brand name by DuPont, which was launched in 1962. As you saw, Elastane is a man-made material, however its use combines both man-made and natural fibers, which we will see next. Elastane is made of polyurethane, which is a polymer produced by a chemical reaction of a polyester with a diisocyanate. The resulting polymer is then spun into fibers. It is considered an elastomer due to its ability to recoil to its original length after being stretched up to seven times its length. The actual fiber production happens after the polymer reactions, in which the prepolymer is produced and then reacted with diamine in order to extend the polymer chains. All of that is then made into a spinning solution, which is pumped into a spinning cell where the fibers are created. The last step is to treat the fibers with a finishing agent and then roll them onto a spool, which is the final product that is then used to weave it with other textile fibers such as polyester, nylon or cotton for producing clothes. Elastane fibers have several properties, which make them very useful in the textile industry. The first and most important one is the stretchability of the fibers, which are capable of stretching up to 500% their original length, and then return to the original length after the tension is released, without losing their shape or ability to stretch again in the future. It’s for this reason that elastane is the most stretchable of all textile materials available. These fibers are highly resistant to abrasion and also very lightweight, which is the second most important quality and reason for why they are used. In combination with other lightweight fabrics, elastane makes the finished garment fit more comfortably, while also allowing for a wide mobility range. Think of yoga pants, for example. Because they are so stretchy and durable to abrasion, they help other textile fibers to better retain their shape and also avoid creasing to a much higher degree. Another characteristic is its lack of sensitivity to sea water, sunscreen, different cosmetics, body oils and perspiration, as well as detergents. In fact, elastane fibers are incredibly easy to care for and often times all they need is a quick rinsing, no need for washing machines or fabric cleansers. One such case, for example, are swimsuits that are made with elastane fibers. Physically, the fibers are smooth and soft, which along with their elasticity, make garments very comfortable to the touch. Again, think of yoga pants and leggings, which are arguably the most comfortable types of bottom wear. Lastly, there are no pilling or static issues with elastane fibers, thus they won’t lose their appearance over considerable periods of time. As we mentioned above, typical fabrics that are used in jackets are often rigid and stiff, especially Nylon. While it may not be much of an issue with winter wear or jackets that are used for daily ventures, the stiffness of the fabric becomes a nuisance when it comes to sports’ jackets. These jackets are specially designed in order to provide the best performance, be it in breathability, weather-resistance and comfort in wear. While fabric technologies or main fabrics, such as Polyester and Nylon, take care of the first two elements, when it comes to comfort in wear, sports jackets must allow for maximum mobility. This is where elastane fibers come into play. Apart from helping the main fabric to be sturdier and also less prone to creasing, such as in the case of Cotton, elastane helps them become more flexible and stretchable. This is a key factor in sports jackets and sportswear in general, where mobility is essential. The most common jackets that contain elastane as part of their composition are softshells. These are typical sports jackets, highly breathable and suitable for activities that require lots of movement. Aside from that, softshells are used as part of layering, typically worn under a hardshell jacket, which has better weather-resistant qualities than the average softshell. 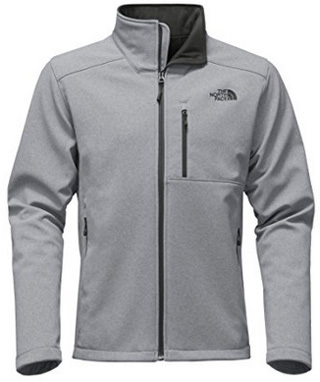 In this regard, a softshell jacket should be fitted to the body in order to not bulk up under the upper jacket. This would not be possible without the presence of elastane fibers, which allow the jacket to fit snugly on the body, while at the same time allowing it to stretch during movement. Typically, the percentage of elastane fibers used can range from 2% to 5%, and rarely even higher, depending on the jacket. The way it is used is by weaving the fibers together with the main fabric’s fibers in order to create a seamless, smooth and well-performing fabric. Like any other man-made product, elastane also has its impact on the environment. The raw materials and chemicals used in their production eventually add up. In regards to use and wear, the most common issue is that of over-stretching, which is when the fibers have exceeded their stretching limit and their ability to return to the original shape decreases with time. Overall elastane fibers do not have a very long life, as their overall durability is not the best, thus making it necessary to routinely purchase new garments that are made of high elastane percentage. Elastane invention revolutionized the textile industry, as finally it was possible to create clothes that not only wore better, but that were more comfortable and would retain their shape for longer. Its use in jackets and sportswear made the creation of better designs possible, thus optimizing the performance and results of professional athletes. Previous Article← Canada Goose vs Nobis: Which Brand is Better?